Clay has a deep passion for the game of golf, from the history to the beauty, and this passion is evident when teaching his students. The development of the students is extremely important to Clay, whether it’s a number they are trying to shoot or their overall experience playing the game. With over a decade of teaching experience, Clay has learned a key factor in what makes his students successful lies in their ability to understand their golf swing and maintain consistency with their game. 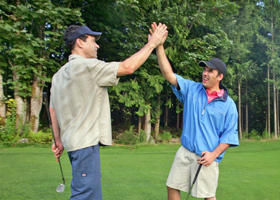 Understanding your golf swing, allows for quicker results and a lifetime of enjoyment. I have been a member of the Canadian PGA since 1962 beginning as a club Head Professional, and finishing up as a Director of Golf. The last 8 years I have been a Teaching Professional at the Okanagan Golf Club. I am not a believer in rebuilding golf swings, but prefer to work with what talent people have and improve that talent, along with spending serious time on the short game of 100 yards and in to lower scores and handicaps, and make the game and practice fun and enjoyable. Lower scores guaranteed! !